One of the most extraordinary examples of January's official birthstone is this objet d'art featuring what is believed to be the world's largest polished garnet. Reminiscent of the jeweled eggs designed for the Russian tsars by the House of Fabergé more than 100 years ago, the "Garnet and Diamond Egg Creation" by Idar-Oberstein-based Manfred Wild was carved from an immense rough garnet sourced in Orissa, India. The garnet egg, which possesses the deep red hue of a fine claret wine, weighs 5,696 carats. The egg opens to reveal a diamond cross mounted in 18-karat yellow gold and platinum, set on both sides with a total of 456 diamonds weighing approximately 8.50 carats. The cross is embellished with a single octahedral brown diamond at its center, weighing approximately 5.74 carats, and five cube-shaped natural yellow diamonds, weighing approximately 10.04 carats. 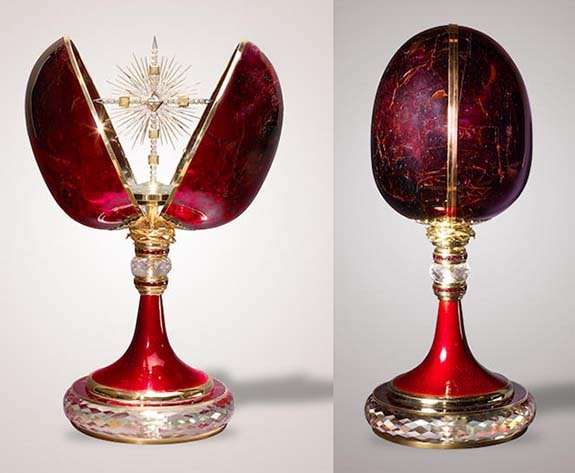 The cross emerges from a large faceted rock crystal quartz, measuring 125mm in diameter, and beneath the egg is an 18-karat gold "crown of thorns." When turned, the crown opens and closes the egg. The stem beneath features two rows of almandite garnets — 46 in all — with a faceted rock crystal acting as a spacer between. The entire object is crafted using 403 grams (14.2 ounces) of 18K gold and 30.50 grams (1.07 ounces) of platinum. The egg measures 150 x 120 mm (5.9 inches x 4.7 inches) and the mounted piece has an overall height of 12 inches. In November of 2014, the "Garnet and Diamond Egg Creation" was one of the top lots in a Bonham's Los Angeles auction titled "Gems, Minerals, Lapidary Works of Art and Natural History." Its pre-sale estimate was set at $300,000 to $400,000, but the piece remained unsold. Coveted by kings and commoners alike for thousands of years, garnet is a versatile gemstone that comes in a wide variety of natural colors, including pink, purple, orange, yellow, violet, green, black, brown and deep-red. Garnet varieties commonly seen in jewelry include pyrope, almandine, andradite, demantoid, grossularite, hessonite, rhodolite, tsavorite, spessartine and uvarovite. Garnets achieve their range of color from trace amounts of iron, manganese, calcium or aluminium in their chemical makeup. Credits: Photos courtesy of Bonhams.